These are my thoughts in creating the characters, where they came from and what they mean to me in their development. I have also included info from those who have developed characters to answer the question of keeping true to their creation. Croc Roc (you must think of him as a living legend) is a diversified company with many areas of development in branding/licensing and marketing of eight characters in “Tunesville” with Croc Roc being the main focus (see the Croc Roc story.) We welcome those groups or individuals who can see our vision and would like to grow with us to develop a great working/business relationship in making a difference to make dreams come true. Below is a brief summation of our approach in developing Croc Roc and the characters. I believe you will enjoy where we are going with regards to Croc Roc and the Croc Roc Academy of Sciences, we are developing the Croc Roc company in many areas of entertainment (always with an educational theme) “Croc Roc, The Life, The Legend, The Rock “n” Roll”, movie/stage version. I have rewritten the Legend story to add more diverse adventure with the kids. We would like to discuss the possibilities with major artists in bringing their talent in voice overs, singing and instrumentation. We have a dream list of those we would like to consider Elton John, Julian Lennon, Taylor Swift, Norah Jones, Johnny Lang, Bruno Mars among others. As well as the support of major artist in the production of the movie, apps, games (proceeds for the stage version revert back to the Charity and any group we enter business with has to donate 1% to the Charity). Croc Roc’s has three comeback songs entitled “Rockin Under a Crooked Moon”, “Red Boogie Shoes” and a piano piece entitled “Winds of Autumn”. I have licensed the rights to the Charity to use the logo, characters and name which gives us a crossover effect in promoting both entities, as we move forward we are looking to build the first Academy building an all wooden structure which will be the first one to be built the in the US, we also have a renowned architect Michael Rotondi to bring phase one of the design that will be built in Hollywood on Sunset working with Brian Folb of Hollywood Offices (owns the property) and the Chamber of Commerce who wants the family element there. The building will have offices, class rooms, a small auditorium for performances and a real Croc Roc Cafe to support it with merchandising. The classes would be filtered down into the schools or homes and we will provide the student instruments/computers etc., and will follow them through their entire schooling as long as they continue their vocation. It is our mission to give children of all ages the opportunity to fulfill their goals and dreams in music and arts, where our schools have been depleted of those courses, we will make a difference. 1). 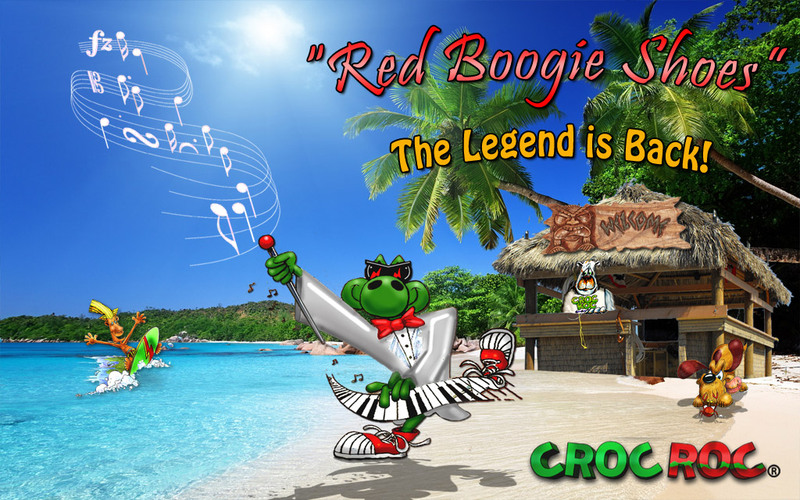 3-minute Sizzle Reel of 3D animation of “Red Boogie Shoes”. We will develop/write a synopsis of the music video. It can be used along with the movie/stage/tv script to show the overall characters. The short synopsis: Croc is sitting at the piano in the cafe and looks over at his display case where his red tennis shoes as an idea flashed through his head as he ambles over to open it up, tries them on. He then begins to almost dance on air back to the piano and begins laying out the beginnings of “Red Boogie Shoes”. The kids are outside the cafe listening, they step inside and pick-up their instruments with a guest on drums, as they begin laying out some unheard of licks. 2). Script for 3D animated movie/stage version/augmented reality/tv of the “Croc Roc, The Life, The Legend, The Rock “n” Roll” story. 3). Website continuous reconstruction improvements: character development, games “Croc Roc’s Chart Beat” and “Bubba’s Gabble Foozle”. Reality shows “Lela May Show” along with Molly, she discusses subjects such as helping the homeless, the environment, safety, and Captain Rudy’s Safety Patrol for children causes among others. Then there is “The Woodie Show” where he and JoJo have guests like Bill Gates, Steven Hawking, among others on new technology, space frontier, energy, history, medicine, nanotechnology, stem cell research and other new advances around the world etc. 4). Branding/licensing: this where we will make the most profit (the movie profits are small, but the merchandising is most important to negotiate): plush toys, games, characters, Tunesville, Croc Roc Cafe, including the lighthouse which Captain Rudy of the Tunesville fire department runs. 5.) Music: soundtrack, videos and singles that I have discussed this with the music industry and the tech’s to bring the old back into the old. We can do this by making singles like the old 45′s and 331/3. Just like when we’re kids it made for collecting and trading, this can be developed in hard copies as well as in virtual reality. The CD disks can be in cool see through colors with different label styles in the middle, numbered and dated ( just like the old records.) I have the lyrics to “Red Boogie Shoes” (his first comeback song); “Rockin Under a Crooked Moon” (his second) and then a piano piece that I wrote entitled “Winds of Autumn”. I also have one of the lyrics written that helped make him a Legend “Stepin into the Night” (we may need two more from his past). These will all go into the Legend story soundtrack entitled “Colours on Canvas”. 6). We need to hire the right group of techs, producers, artists, writers among others that have interests in not only the future and music but, who will keep the vision and the foresight to think outside the box. 7). The industry is always changing especially in the Tech field. The App icons may be out within the next year and be replaced by virtual streaming. But, until then we need to develop games and other educational challenging apps that will bring in revenue. Get the latest news on Croc Roc and his amazing friends!